Aftermarket Suspension Options - whats your experience? I am planning on buying a custom rear leaf pack from Agile along with tuned Fox 2.0 Remote reservoir shocks. I would really like peoples impression of this set-up and peoples impression of the couple add-a-leaf kits out there (Vancompass etc), if anyone out there has ridden in both a comparison of them would be amazing. I am concerned with the ride harshness of the add-a-leaf system. The factory leaf set is pretty miserable and adding stiffness to it seems like a bad idea, but I still wonder what peoples experience is. For the front I am planning on running Agile's coil assist kit, and would love any impressions anyone has of this. For damping in the front I am caught between Vancompass's auxiliary shock and waiting for Agile to finish development of their replacement strut. I would also love to hear any feedback on sumo springs, air suspension etc. Please be as specific as possible about your set up, the high points and the low points of your set-up. Including tire size and inflation pressure would help immensely as well to sort out the differences between everyones set-up. Re: Aftermarket Suspension Options - whats your experience? I think this is going to be tough to compare directly. I have not read a single bad post between van compass or agile's setup. They both essentially accomplish the same thing but with a different approach. From what I've read, and my own experience with after market suspension in cars, harshness, stability, and sway/rocking should improve with both setups. Factory suspension has to work for all ranges of weights and center of gravity. Once you're setup and built out, going with an after market suspension tuned to your weight is going to be better than factory in almost every regard. The main differences I've seen thus far is that van compass's setup uses the same suspension geometry. Your alignment will be roughly the same and the resulting max articulation will be about the same. Just the suspension kit doesn't add lift in the front or the rear (except to raise the rear to a level height). Agile's setup does add lift and the resulting articulation will be better. My assumption is that they've increased suspension travel to accomplish this. If I had to guess, rocking won't be as controlled as the van compass setup. On road handling will be slightly worse due to the taller ride height. However, offroad comfort will be better due to better articulation. The ride will likely feel more floaty on pavement, but smoother on rough terrain. These are generalizations when it comes to ride height, travel, and performance. Another thing to note is that the van compass setup retains and requires the factory front suspension to work optimally. You'll essentially be responsible for 4 different shocks up front. It's a more simple install, and likely cheaper, though. If either shock fails, you still have another shock to do a lot of the work while you wait for parts. The Agile setup is a front suspension replacement. While I trust Agile knows what they're doing, you're likely going to be one of the first with this kit. I know Roam Buiilt's rig is running this and I think he's had great luck with it so far. We're planning on Agile's setup for our build. My reasons are: 1) we have local support, 2) I don't like the idea of 4 shocks up front, 3) we'll sacrifice a bit of agility on pavement for offroad comfort. Vancompass does have a lift kit for the 4x4, but as far as I know, it retains factory suspension geo, which means essentially factory articulation. I wouldn't be too concerned with harshness from the leaf. As long as the leaf is matched to your van's weight, the shock will be tuned accordingly. If I had to generalize things, I'd say Van Compass will be better suited for on-road performance vs Agile's more offroad performance. I mean this strictly from a comparison standpoint as they'll both be better on and offroad than factory. This really comes down to the higher ride height and increased articulation of Agile's setup. I don't think you can go wrong with either kit, though. Both awesome companies with great support. Well I’m going to be biased since I design our (Van Compass) suspension components but I figure I would chime in anyway with the rhyme behind the reason for how and why we made our sprinter suspension packages the way that we did. Additionally, there is a lot of bad and incorrect information out there regarding suspension upgrades. My intention for this post is to simply put out correct information. First, what is it most of us don’t like about how the Sprinter handles both on and offroad? As a suspension engineer by trade with over 10 years of experience designing and manufacturing suspension systems and other off road aftermarket components for Jeeps and Dodge trucks and someone who personally owns and drives one of two sprinter vans everyday over 60 miles a day, I can tell you the things that I personally didn’t like about the ride quality of a stock sprinter van. •	Ride harshness. Relative smooth roads didn’t seem too smooth anymore. •	Head jostling, damn near violent sway / rocking with uneven, low speed road conditions. (Lack of low speed damping) Most noticeable when pulling into and out of driveways at an angle or tackling speed bumps in a parking lot at an angle. •	Ride harshness. Washboard roads and rocky forest roads were near unbearable. •	Head Jostling, damn near vilent sway / rocking with uneven, low speed conditions, again a severe lack of low speed damping to control the tall center of gravity and most importantly, overly stiff sway bars. •	Lack of articulation and overly stiff sway bars causing unnecessary tire lifting and severely limiting articulation. Now, how to address these issues; I’m just going to focus on ride quality since that is the focus of this thread. I will not get into our suspension lift kits and fitting larger tires and why it is a beneficial upgrade for many individuals as this thread seems to be more focused on ride quality and drivability. I can go into that as well if desired. Shocks. The OEM shocks are cheap and are designed to cover a wide array of weights / and chassis configurations. The sprinter suspension, was most likely designed for its intended customer base, which are not the individuals on this forum. The sprinter customer base is commercial; Fleet trucks. Thus, cost, longevity, and maintenance were likely the priorities in the chassis design, not ride comfort and on or off-road prowess. A simple upgrade to a quality, tune-able monotube rear shock will make you love your van 10x over. I guarantee it. Do not waste money on Konis, they are junk. We have dealt with them, they are poorly made in comparison to a Bilstein or Fox and we have replaced countless sets with very low mileage on them. We have installed brand new ones per customer requests and the ride is improved over stock slightly but are not even in the same league compared to when we do our Fox upgrade. Konis have very little compression damping in them and rely solely on rebound damping. Do yourself a favor and before doing anything else to your van. Get a set of tuned Fox shocks from us (Van Compass) or Agile and you will immediately be happy. Rear spring rate. The OEM spring is a good spring. It’s a leaf spring. It’s technology from the 1800s and it is still in use today. OEM spends millions and millions on chassis design and making sure some, not all, components will never need replacement. I personally have never had a vehicle where the OEM rear leaf springs have worn out and lost spring rate. If you have a relatively light van, I.E. not nearing the GVWR of the van, we do not recommend adding spring rate to the rear of the van as it is just not needed. More spring rate means more damping will be needed to control said spring rate to keep the van from rocking, swaying violently and feeling harsh on relatively smooth roads. It is my understanding that the Agile full replacement rear leaf pack has more spring rate than the factory leaf pack, but I cannot say for sure. I know they do a lot of custom leaf packs depending on the customer’s vehicle. 1. I like OEM components. They tend to go the distance. I know this is a contradiction to my stance on shocks, but shocks are a wear item. They are meant to have a shelf life. The rear leaf spring on a vehicle is not a wear item. It is designed to outlast the vehicle. Thus we wanted to keep it on the vehicle and design something to give it a little help and fit our goals. 2. Our add-a-leaf pack allows us to give heavy vans at or near the GVWR a slight spring rate and ride height increase to help control the additional weight which they are always hauling around as well as get them back to the same amount of uptravel the van had when it was an empty cargo van, thus preventing excessive bottoming of the rear suspension and improving the ride quality. 3. Cost. Making a full replacement pack is expensive and the retail price has to be high for it to be cost effective for the manufacturer to justify producing it. 4. The way our add-a-leaf pack is designed allows us to use it in a variety of applications. It allows us to tune ride height, getting up to a 2.0” lift for those desiring a big increase in tire size and ground clearance, as well as just being able to use it on heavy vehicles just needing a slight increase in spring rate and ride height. Front suspension. Harshness in the front end, again, is down to a lack of damping in the factory struts. In my opinion, the front of the OEM spring rate on the front of these vans is adequate for the weight that the front of the van carries. There are exceptions to that. Cab & chassis motorhomes and some heavily built out 3500s could stand an increase in spring rate. In this case, we recommend installing a Sumo spring. It is a cost effective solution and adds spring rate to the chassis in an area that is designed to handle the full weight of the vehicle. Side to side sway / rocking. Yet again, this is due to a lack of low speed damping in the front struts. There simply is not enough damping in the factory struts to control the tall chassis and overly stiff front sway bar. A sway bar is a spring. Load one end of a sway bar, and the other side wants to unload. It’s a giant solid bar that you are effectively twisting as the van handles bumps unevenly going down the road. It is this loading and unloading of the front sway bar along with inadequate damping that is most conducive to the violent rocking which Sprinters are so well known for. We address the improving the front suspension ride quality with additional damping. •	We add a secondary shock to the front of the van. Again, we use Fox shocks combined with bolt on shock brackets and tune each shock kit per vehicle depending on your van’s weight and your primary use. •	We do not add spring rate or ride height unless requested and is needed, IE a very heavy van. But let’s not forget, where is most of the additional weight carried in a van? The rear, not the front. •	We put a lot of rebound damping in the shocks to control the unloading of the sway bar and drastically limit the side to side sway / rocking of the vehicle over uneven, slow surfaces. The increase in compression damping and the amount of additional damping drastically improves off-road performance with fast, small bumps (washboard for example). •	Our front shock kit can be bolted on a bone stock 4x4 van without the need for less wheel offset or a wheel spacer. A benefit to an additional front shock is that you have a backup should a stock strut blow out or wear out prematurely. And I promise you, your front struts will wear out. With our kit, that secondary shock acts as a redundancy should you loose a strut on a long trip. •	Our front shock kit is a relatively cost effective upgrade. $700 for all the components and detailed instructions so you can install it yourself in your driveway with simple hand tools or contact us to set you up with a quality installation shop. •	No alignment is needed after installing our front shock kit. •	It puts the front CVs at an increased operating angle. •	It adds spring rate to an area of the chassis not really designed to carry spring rate and into a wear item. The spring rate load is being loaded into the stock rubber strut bushing which is already a commonly serviced part. The top of your strut bolts right under your feet to just sheet metal. This is the reason we like the Sumo spring for a spring rate increase as it installs where the factory bump stop is and transfers load into the suspension sub frame which was designed for it. •	Wheel spacers are required. •	You are more likely to be lifting a tire when articulating. The van is lifted in a way where down travel (droop travel) is lost. Heavier spring rate means more force is required to compress the suspension, again hindering articulation without lifting a tire. •	The van is no longer driving down the road with the OEM ride height suspension geometry. Steering and control arm angles are increased and alignment ability is limited. We do our suspension lifts very differently and extend every suspension component accordingly so suspension geometry is the same as OEM and all corresponding components are relocated or replaced so suspension angles are unaffected. I could go into more detail, but this thread is about ride quality, so I’ll just leave this alone for now. I run our red van which is on 315/75/16 tires with our 2” lift kit and no sway bars front or rear. And the way we convince people about our suspension set up is to come drive the red van. It is a dream to drive in all road conditions both on and off-road. Even with a trailer behind it towing 5k lbs in heavy wind conditions. Unless Agile is making longer sway bar links and installing significantly longer travel shocks and disconnecting the front and rear sway bar, you are not getting much, if any increase in articulation. That is a misconception as shock lengths and front and rear sway bars are the limiting factors of the Sprinter van’s suspension. Whichever suspension upgrades Sprinter van owners decide to go, with Van Compass or Agile. Don't waste money with air bag kits and crazy heavy rate after market front or rear sway bars. Both Van Compass and Agile have extensive backgrounds in the automotive off-road aftermarket and are here to produce results to optimize your van life experience. I’m sure I’m missing a few points and will likely ruffle some feathers but we get these questions on a daily basis so hopefully this information will help educated Sprinter owners understand where and why upgrades should be made. I'm not sure what Agile's exact mechanism is for increasing articulation. They posted before/after photos somewhere, and it was quite a bit of articulation increase with their kit. I'm assuming the mechanism for increased articulation will be known when they release the kit. You guys don't run sways at all on your 35" setup? Is this from all the low-speed compression that's dialed in? Which kit release are you referring to? I've seen the flex photos of their RIP kit before, I'd be curious to see if the sway bars are hooked up in the photos. For example, on a bone stock van, if you simply disconnect the front and rear sway bars you can lift the front tire on the van 4" higher with a forklift before the rear tire comes off the ground. This photo on our instagram feed was with just the front bar un-hooked. We got another inch of articulation with the rear bar off as well. If there is an increase in articulation from the Agile kit it is only coming from the rear of the vehicle. IE, a rear shock which has a longer extended length than the OEM shock. Their replacement leaf pack also likely allows the suspension to flex a little more when lifted with a forklift. Forklift travel / articulation is not necessarily the same as real world articulation where significant momentum and weight transfer is involved. I am excited for the new tune-able replacement strut they are working on. I should also mention that all Agile front suspension components are compatible with the Van Compass suspension packages. So you could easily run an Agile coil assist kit or their new strut in conjunction with our dual front fox shock kit or lift packages. And yes we run no sway bars front or rear on our test van due to the significant increase in low speed damping (more so rebound than compression damping) and the benefits are substantial. To the point where we are developing a sway bar disconnect kit soon. Yeah, I could see increased LSR would help control body movements on side to side rocking motions, but wouldn't you need to increase LSC to control body roll on a paved road? I'd think the amount you're increasing it to replace a sway would come at the detriment of traction in loose conditions. Or is that what you're saying - sways off are great in the dirt, sways on for pavement? I'm reserving judgement on Agile's setup until they fully release it. If you guys were able to do a 35" with sway disconnects, that could be enough to.......sway me. Last edited by Wrinkledpants; 12-01-2017 at 09:56 PM. • Our front shock kit can be bolted on a bone stock 4x4 van without the need for less wheel offset or a wheel spacer. A benefit to an additional front shock is that you have a backup should a stock strut blow out or wear out prematurely. And I promise you, your front struts will wear out. With our kit, that secondary shock acts as a redundancy should you loose a strut on a long trip. do these work on 4x2 vans? Unfortunately we cannot package a secondary fox shock up front on a 2wd van due to the design of the suspension subframe. There is a kick out in the suspension sub frame that prohibits us from fitting a secondary shock in there. We tried. We have other options available for suspension upgrades for 2wd vans. Check out our website for more information. We do also add a significant amount of compression damping in our shock kits. My van runs no sway bars full time and am running a much more aggressive shock tune than what we typically put together for customers to compensate for the lack of sway bars on road. So far though I can't justify a reason to not recommend this set-up for a production based package. That's the same photo I've seen as well. Hard to compare anything without before / after measuring tape shots and non-bias recording. Again, forklift flex is not the end all. It's just a way to measure and check for clearances. As for 35" tires. Fitting those tires has nothing to do with sway bars being on or off. It comes down to how we lift the van. Fitting that large of a tire without significant body modifications can only be done with our 2" Striker lift kit. Right. 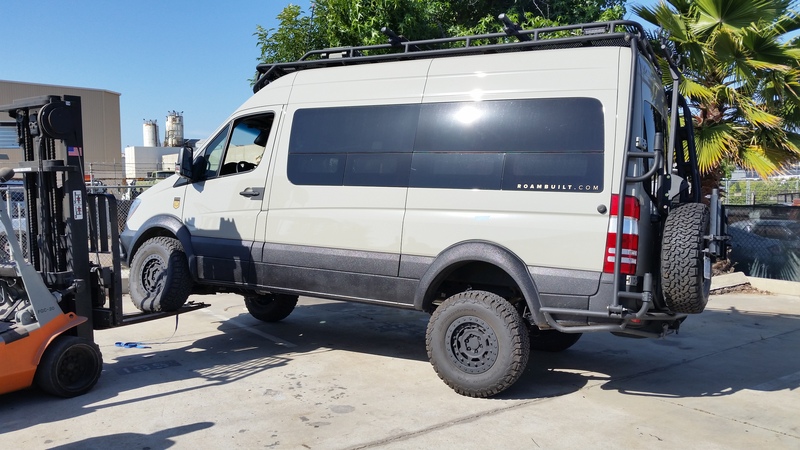 I just mean that if you can get a striker lift, 35" tires, AND do sway bar disconnects from one quality vendor using fox equipment (aka Van Compass), I would likely pull the trigger on that. As mentioned above, the big appeal from the Agile setup is the articulation. My assumptions are that the Agile production version will be reliable and not jeopardize the chassis. However, you're kit is already solid and production ready. So, adding sway bar disconnects would put me into the van compass camp as I can get everything I'm looking for. If there is sufficient LSC damping on those dampers to support a highroof with a rack and a full load on the roof, then I could see doing a complete sway bar delete and just turn some dials when back on the pavement. That would actually be preferable to disconnects, at least from a convenience standpoint. In my experience, there is always a downside to running that much LSC, but my experience is all car and bike related. Maybe having big, chunky tires would soak up some of that stiffness? I have yet to actually drive my new 4x4 144 but right off the bat I had Agile Fox LSC’s w/reservoirs installed in the rear and am looking forward to their front struts when available... I’ll also change to a heavier rear sway bar.. got the factory spring dampners... I have 285/70R17’s KO2’s on Method Standards, Backwoods bumper w/Warn Zeon 12S Platinum winch..
Last edited by aksotar; 12-04-2017 at 06:32 AM.